I'll be upfront here and say that I don't understand the pot filler's place on the list of most desirable kitchen gadgets. I know they save you from having to lug a heavy pot full of water across the kitchen but you still have to lug that same pot over to the sink when you're done cooking, and then it's hot and steamy as well as heavy. Much like a laundry chute where it's super to be able throw all the dirty laundry through a hole in the ceiling and have it fall next to the washing machine, but you still have to fold the clothes and carry them back upstairs when they are clean, it's efficientish. Having said all that here are a few modern-looking pot fillers that from a design perspective I'd give a little wall space to. 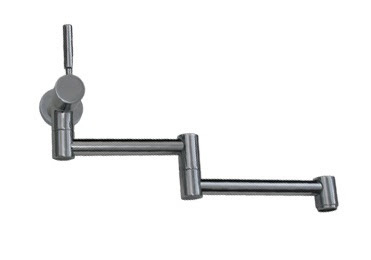 Grohe Ladylux Pot Filler. If this is as robust as the Ladylux faucet we had in our last kitchen it will be worth the money. And who can resist that come-hither lever? Available in wall or deck-mounted versions, in stainless steel. $1029.00 retail, around $625 from online faucet sellers. 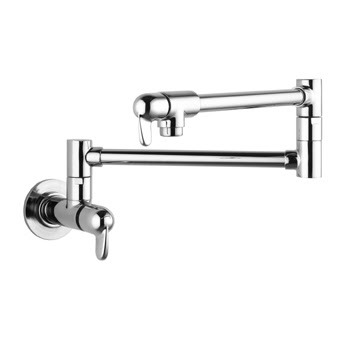 The very simple Whitehaus Decohaus available in brushed nickel or chrome, for half the price of the Grohe. It also comes in a cross-handle model. Hansgrohe Allegro. This faucet has cute stubby little levers that I just want to pinch. It's available only in chrome, list price $662. But once again there are bargains out there. 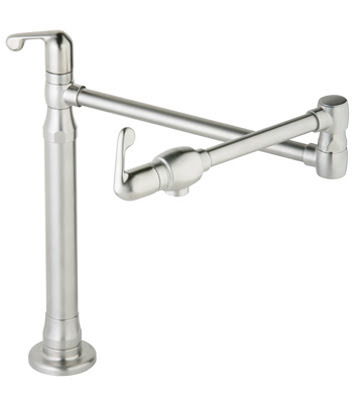 Hansgrohe also make a similar model Talis, but the lever is so tiny I'm not sure how I'd operate it. I've had the same questions about the practicality of the pot filler. Maybe it has something to do with lifting a large pot full of water out of a sink? Or maybe you don't filter the water from the kitchen sink but you would from the filler? Either way, I don't need the additional expense. I'll carry the pot both ways. I'm not a big fan of working around the kitchen, but the way I see it is your looking at the glass half empty. The laundry chute analogy and the pot fillers make a part of the job easy. Not the whole job, but a part. However, I think that the small part that they play in the role of using the pot does not justify the expense, but as I said I don't really like to work much around the kitchen. Thanks for your comments. Another thought occurred to me today as I emptied the bucket we keep under the sink because one of the hoses leas. What happens if there is a problem with the cold water pipe leading to the pot filler? If there is a problem with the sink faucet we open the cabinet door, lie on our backs with a wrench and fix it. With a pot filler there is usually a very heavy range in the way and a tiled wall too. I've never understood the allure of pot fillers either. But I do love the look!